In a rare development, House Speaker Michael Madigan, a Chicago Democrat, sought out and received the support of progressive Cook County Commissioner Jesus "Chuy Garcia in his contested bid for the 22nd House District against newcomer Jason Gonzales. Told it sure seemed he'd never endorsed Madigan before, Garcia, the former candidate who forced Chicago Mayor Rahm Emanuel into a runoff election last spring, laughed for several seconds, then said, "That's very, very well put. That's very perceptive. This is very new for me. Kind of like coming out. "It's interesting because we've been on different sides," Garcia continued, "especially on local politics, for a long time. It's interesting to find a point of convergence and that's Bruce Rauner." Garcia's press release noting the unusual endorsement immediately tied it directly to his concerns about the governor. "In light of Governor Rauner's 'turn-around' agenda that has resulted in devastating austerity measures that affect middle class and struggling families, I am endorsing Speaker Michael Madigan for reelection as State Representative of the 22nd District of Illinois," it said. In a phone interview, Garcia described what led to the endorsement. "He doesn't call once a week, for sure, that is the case, but he called, very politely, and asked if we could sit down and talk and we did, several times in fact." Garcia said he and Madigan talked about the budget crisis and its effects on social service providers, right-to-work and labor concerns, school closures and the Chicago Public Schools' financial crisis. "I felt Illinois has never been in a position like this," he added, "where a very wealthy person has become governor and then embarks on an agenda that goes against the interest of working people and low-income people. I think that the threat is real and it reminds me of the type of attitude that is exemplified by the Koch brothers at the national level." Steve Brown, Madigan's spokesman, confirmed the Speaker asked for Garcia's endorsement, but he said it was not an unusual event. "The Speaker's contacted hundreds of people during the course of his career and always welcomes support and that recognition," Brown said. "That's a good testimonial in terms of his support. Asked if Madigan's asking for Garcia's support was a sign that Madigan was running scared or concerned about his contested primary from Gonzales Brown said, "No, it's a recognition of the fact that the 22nd District is increasingly Hispanic and Commissioner Garcia is a Hispanic leader in the district and so that endorsement will help." Two other candidates with Hispanic surnames - Joe Barboza and Grasiela Rodriguez - also are running in the 22nd District but are widely thought to be straw men put up by Madigan supporters to dilute votes for Gonzales. Garcia said Gonzales was being supported financially by some wealthy hedge fund executives who share Rauner's anti-labor agenda. He suggested he did not have roots in the community. Gonzales, meanwhile, played into that last contention by announcing Wednesday he'd won the endorsement of U.S. Rep. Seth Moulton, a Massachusetts Democrat who, like Gonzales, is a Harvard graduate. Gonzales' release said Moulton was an Iraq war veteran who was a "rising" member of the progressive caucus. "Jason brings the passion and experience to join a new generation of leaders who will fight for democratic principles and bring innovative, principled leadership to the 22nd District and Illinois," Moulton said in a press release. "I am pleased to support him in his effort to change the direction of Illinois." As Primary Election Day nears March 15, Gonzales' profile has been rising with a number of media outlets featuring him in coverage as he seeks to topple the powerful Speaker who has represented a southwest side Chicago district for 45 years since 1971. Voters regularly have elected Madigan to represent them. 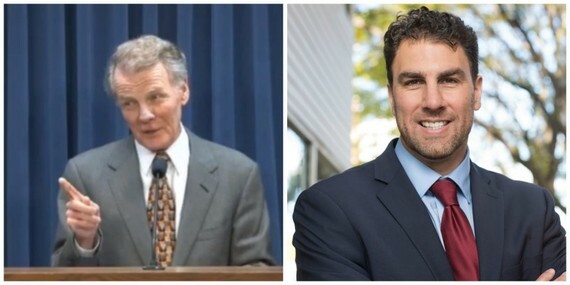 Madigan's fellow House Democratic caucus members regularly elect him to lead their majority as he funds their election campaigns and provides them with needed election foot soldiers. Madigan also has served as chair of the Democratic Party of Illinois for several years. Madigan supporters in the 22nd District also seem to be making campaigning difficult for Gonzales in other ways. Check out the tweet below from WTTW's Paris Schutz and note the date when the parking ban expires.